We understand that installing a water tank can sometimes seem like a daunting task but we can assure you that really it isn’t! Sometimes it is just a matter of getting a better understanding of the subject. So we have put together some useful information below to help you with that. If you are still daunted by it all then you can always engage a plumber to install it for you. In some instances you are required to engage a plumber but it still doesn’t hurt to be informed about the process. 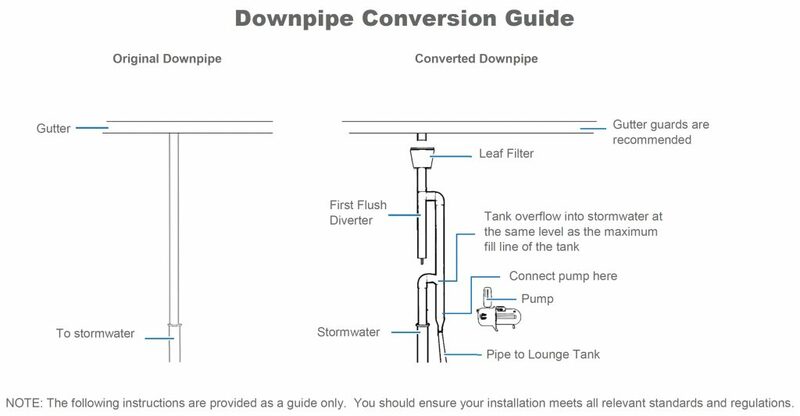 If you are planning to have your rainwater tank plumbed into your house there is a standard that all pipes and fittings have to meet called the Plumbing Code of Australia and AS/NZS 3500 Water Services – Section 2 ‘Materials and Products’. They are also required to have the WaterMark ‘W’ symbol on them to demonstrate their compliance. If you are just doing a simple installation for the garden we suggest, especially in new installations, to use ‘rainwater-standard’ plastic pipes and fittings. If you are unsure what these are your local hardware store can help. To minimise algal growth in the water your tank should be light proof. You do not have to worry about this though as all of Rosemark Water Tanks Products are light proof. Unless you are only going to be filling a bucket from a low pressure tap, you will need to install a pump. The size of pump will depend on the height of the tank relative to any taps or appliances, diameter and length of pipes, number of uses and users, flow rate and pressure requirements of any appliances etc. If you are planning to use your pump to service any internal plumbing then you will need a plumber to install it anyway and they should be able to provide advice on an appropriate pump or alternatively contact the pump supplier for advice. Some useful features you probably want to make sure your pump has include run dry protection, a control device to automatically switch the pump on and off and pump noise levels. You will also need to consider the location of the pump. It is important that the pump is located somewhere that the pump noise will not create a nuisance to occupants or neighbours. Pump covers can be installed to protect the pump and reduce noise. Pruned any branches that overhang catchment areas? Prevented animal and insect access by screening all inlets, overflows, outlets and any other openings? Painted over any large amounts of uncoated lead flashing and stopped collection from roofs containing high levels of lead paint? Cleaned out gutters and downpipes of any leaf litter? Stopped the overflow from appliances such as evaporative coolers, water heaters draining on the rainwater collection area? Allowed for the gutters to have sufficient and continuous fall to downpipes to prevent pooling? Installed gutter screens/guards to reduce the frequency of gutter clearing? Installed leaf screens to all downpipes that feed into the water tank? Installed an appropriately sized first flush diverter (min. 20 litres should be diverted for every 100m2 of roof catchment)? Checked tree growth every 6 months and pruned as required? Checked inlet, overflow, outlet screens? Inspected gutters every 6 months and cleared as required? Checked first flush diverter every 6 months and cleaned out as required? Cleaned the tank and removed any sediment or disinfected with chlorine if needed? This only needs to be done if you notice a rotten egg smell. Checked pump installation is adequate, water tight and free from debris and serviced/replaced every 10 years or as recommended by the pump manufacturer?Note: odourless microbial films will form in any container that constantly holds water but they are not harmful and are not a cause for concern. A plumber is usually required to submit a certificate of compliance to the local planning authority and the customer at completion of the work. If you have plumbed rainwater to your taps, appliances or fixtures in the house they must be installed by a licensed plumber and meet the requirements of AS/NZS 3500 as well as any other relevant state or local plumbing requirements. There must be no direct connection between a rainwater tank plumbing system and the potable water/mains water network. There are exceptions to this but they require specific approval and it is usually safer to avoid it. Backflow prevention devices may be required in some situations where there is a high risk of mains water contamination but this is unlikely if you follow the above dot point. You may need to notify the local water or planning authority of any internal rainwater plumbing work before work is to commence. Rainwater intended for drinking has a much stricter set of requirements and is not recommended if you have access to mains/potable water supply. All above and below ground rainwater pipes must be clearly labelled as ‘rainwater’ to distinguish them from mains or storm water. This can be done for below ground pipes by using identification tape (made in accordance with AS/NZS2648). Every rainwater tank outlet, which includes all taps, must be labelled ‘rainwater’ on a permanent sign. Rainwater pipes must not be installed close to water, sewage or electricity mains. If your rainwater installation is likely to come in close proximity to any services mains check with your local authority on their requirements. Backflow prevention devices work to stop any potential reverse flow of contaminated water into the mains water supply. An approved backflow prevention device may need to be installed if there is the potential that your rainwater will mix with the mains water. It is a low risk if you provide all the necessary air gaps between each water supply or if you are using a mains switchover device, most of them already incorporate backflow prevention suitable for use with an above-ground tank such as ours. We do however recommend you contact your water authority to determine their requirements.